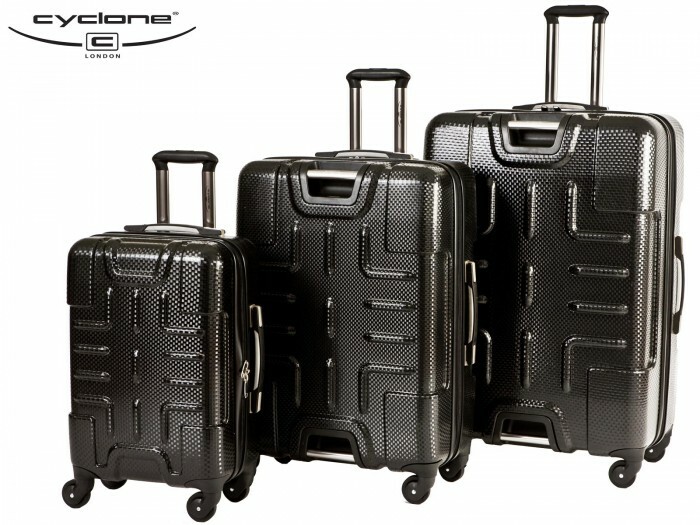 Cyclone Don Polycarbonate 4 Wheel Luggage exceeds expectations in every aspect. 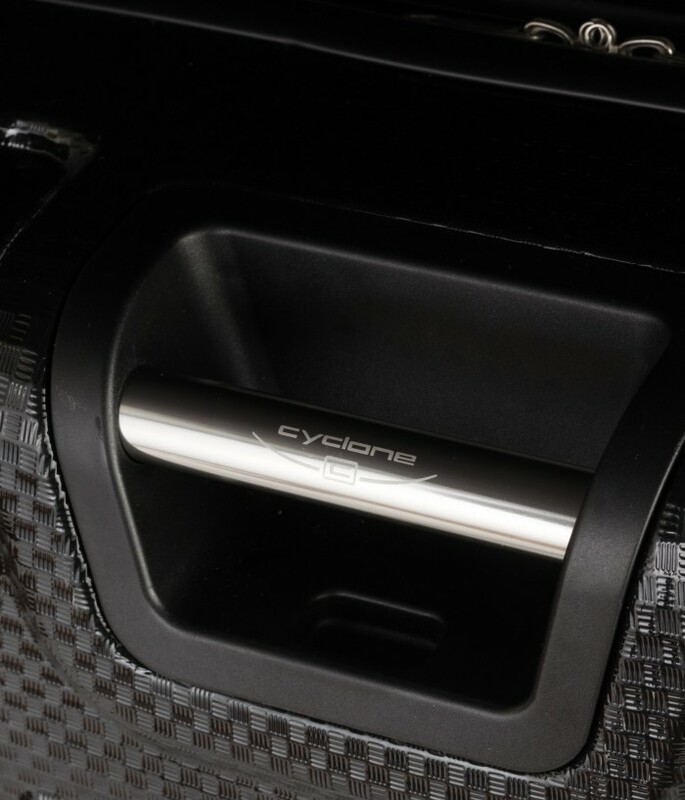 Only the highest quality parts are used, and each case is constructed to perfection. It goes without saying, then, that build quality is impeccable. The Don Means Business! Deep, Smooth Rolling, Very Strong yet LightWeight, and with comfortable jelly rubber handle grips - this case is a pleasure to own and use. Made From Space Age Materials! The outer shell is constructed from the strongest yet lightest polycarbonate material - a material once reserved for use in the most critical of applications by NASA, when they used polycarbonate astronaut helmets to protect fragile human heads when sending them far away into the hostile outer atmosphere! Loaded With The Best Features! Features built in TSA Approved Combination locking system, internal zipped divider, internal zipped pouch compartment, internal load fastening straps, high quality external zippered closure system, strong yet easy to use comfort-grip handles, 360 degree rotational movement with high quality 4 x 4 wheel system. Integrated Parallel Recessed Polished Grab Handles, which ensure the user is lifting the bag using hands, arms and shoulders at optimum position, parallel to the body and at equal lengths on both arms, reducing chances of shoulder, arm and back strain and making lifting and manovering the luggage a very easy task, even when fully loaded! Good for your back = Less Pain = More Pleasure On Holiday! All other luggage currently available, make the users pick the bag up from the outer-most handles, and sometimes even the wheels, which result in the user having to stretch arms out away from the body, and bent around the sides, when holding the ends of the case. this causes abnormal lateral forces to be applied in addition to the required vertical forces, which cause the unsteady, swaying, unstable feeling many people get when lifting large cases alone. This feeling completely disappears when lifting the Don. 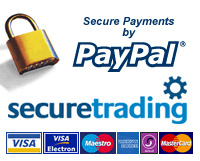 Especially suitable for the elderly / infirm / disabled / physically challenged. The Grab handles also allow for a firm, fixed and easy to access holding point when rolling the luggage around on it's 4 wheels, enabling the user to reserve the use of the integrated trolley only when absolutely necessary and when wanting to use the luggage on its 2 rear wheels only (eg over rough, pebbled terrain or up small kerbs or slopes etc). In this mode, on flat & level ground, the Don can also be used as a walking aid! A world's first - luggage that helps you move more easily! Again, also ideal for the elderly / infirm / disabled / physically challenged.